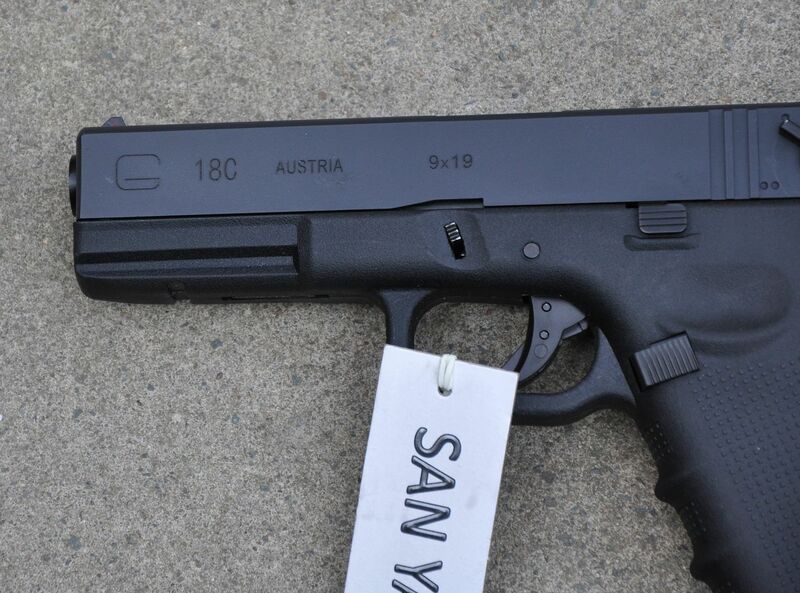 So while I'm waiting on my Glock 17L to arrive I received a SAN YAN Glcok 18C pistol so I thought I'd throw up another Glock review. 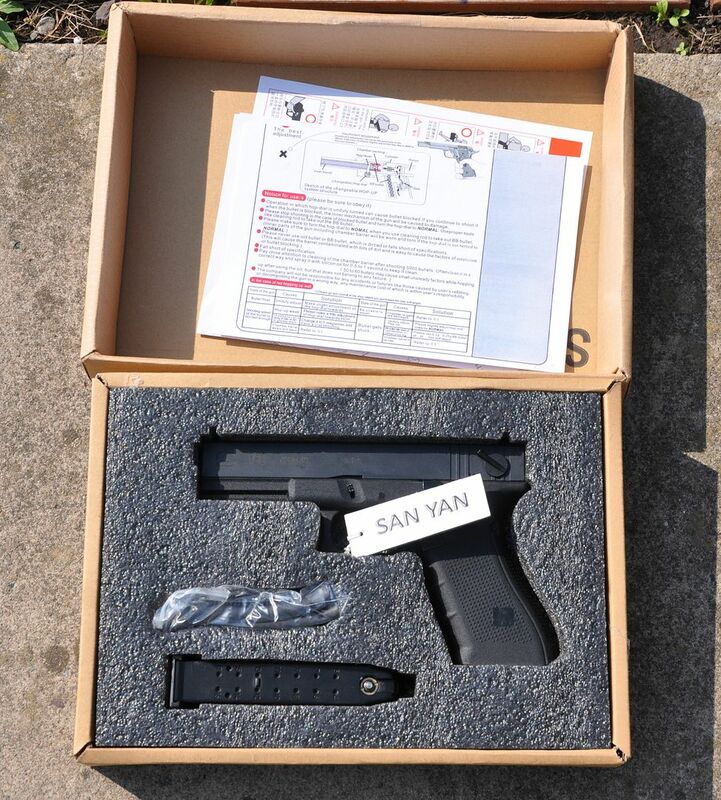 The SAN YAN Glock 18C can be bought for around £45 without postage from the Far East i ended up paying £72 all in. So what do you get for £45? 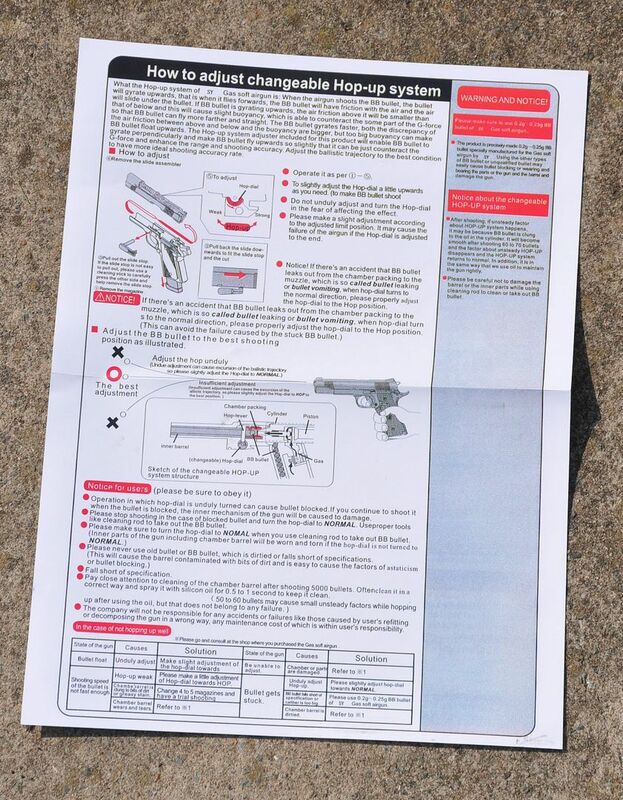 The box is a plain brown cardboard box and inside you have the pistol, Magazine, 2 back straps and some paperwork. 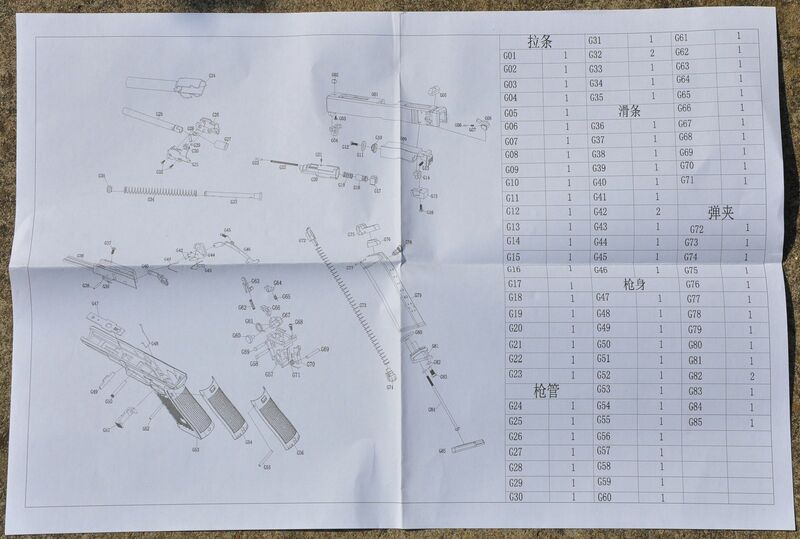 The paperwork is a nice touch and even comes with an A3 sized parts catalog so that you can identify parts easily if you need to fit a replacement. 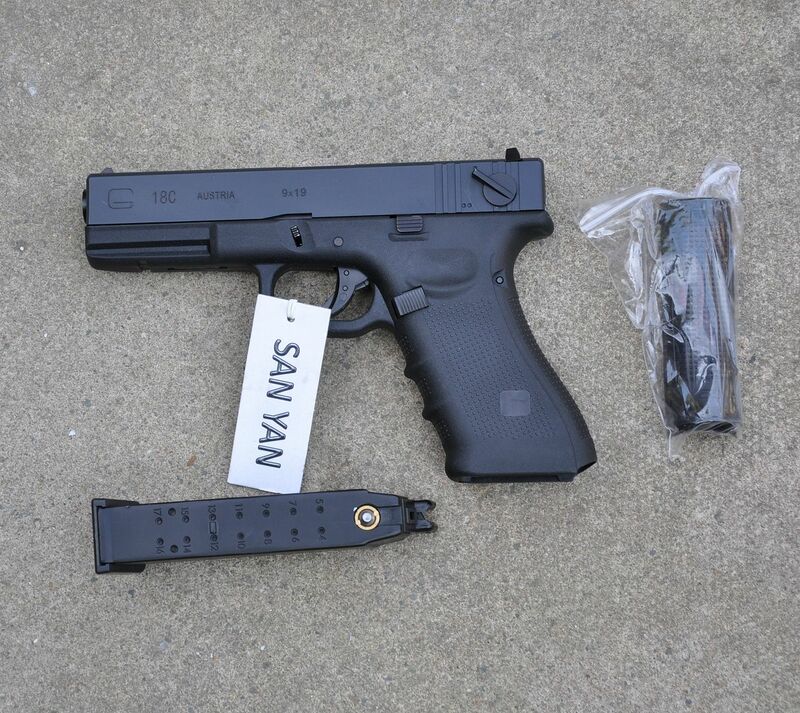 Looking at the pistol it's a direct copy of the Tokyo Marui Glock 18C but has a Gen 4 lower frame and comes with a metal slide and metal outer barrel as standard. Starting with the top slide you get a nice even paint coat with nearly complete markings. 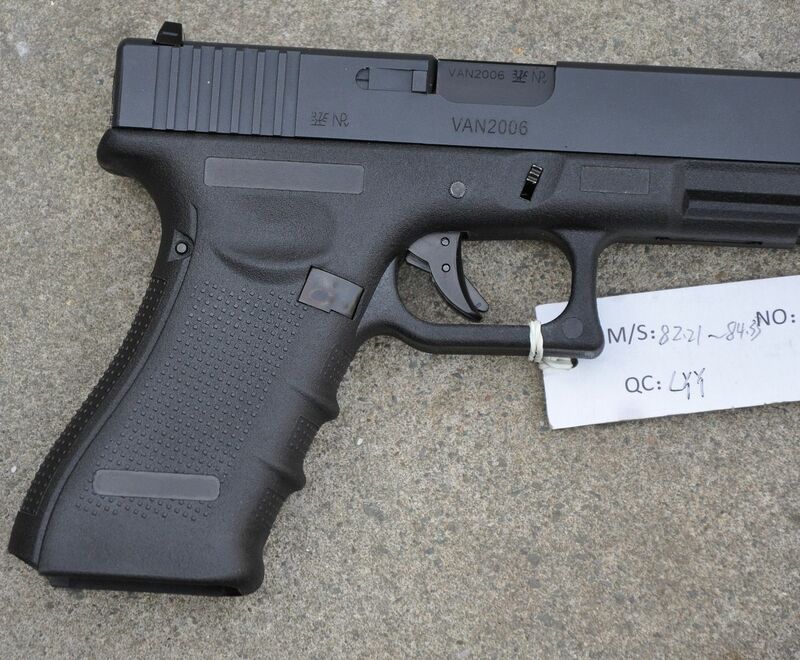 The markings are missing the word glock from inside the large G on the side of the frame. The sights are a dot and U type and are plastic and can be swapped with any TM compatible sights that you fancy fitting. 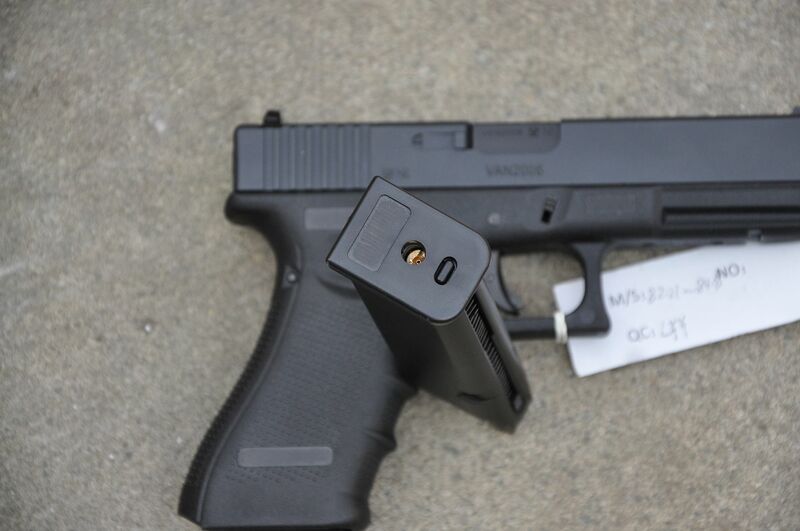 The lower frame is a polymer/Plastic frame based on the Gen 4 Glock frame. 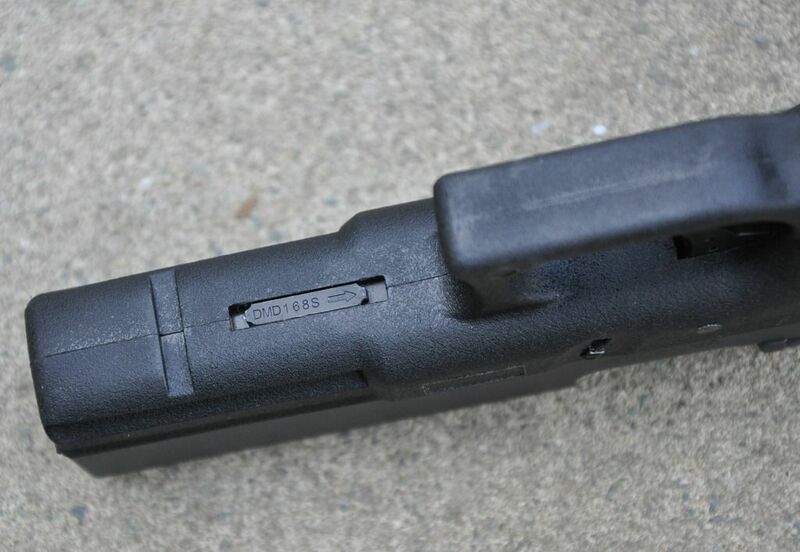 The frame is completely free from trademarks and is missing the 2nd pin above the trigger. For the collector this might be an issue but any TM compatible Gen 4 lower with trades will fit. 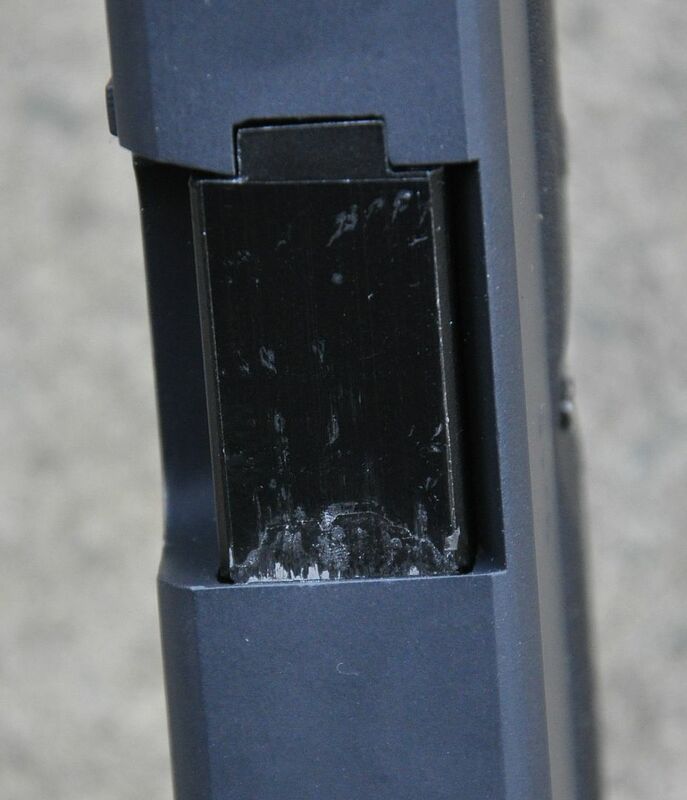 The magazine is TM compatible and holds 23 BB's. The base plate is trademark free as well. The supplied 2 back straps are very good looking and have the correct G markings. Fitting them is easy enough by removing the pin, fitting the new back strap and putting in the new longer pin which comes with the pistol. 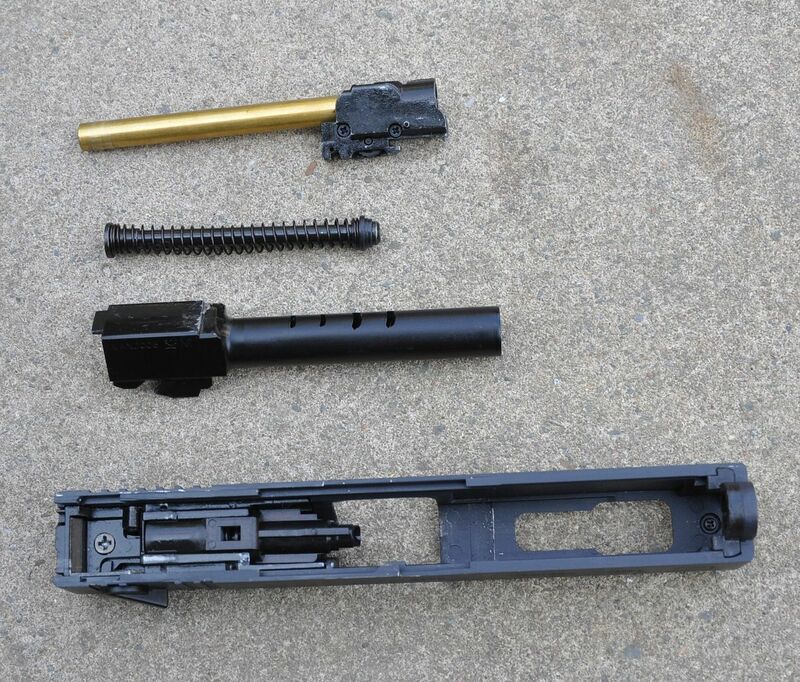 Stripping the upper from the lower shows that the internals all look to be TM compatible. I'll swap a few parts around at some point to confirm this but looking at it I think all TM or TM after market parts will fit. The BBU looks to be well made and gives a good airseal when fired. Stripping the top slide you get a nice TM style hop unit, spring guide and metal outer barrel. The inner barrel seems to be brass and I'll check out the diameter later. 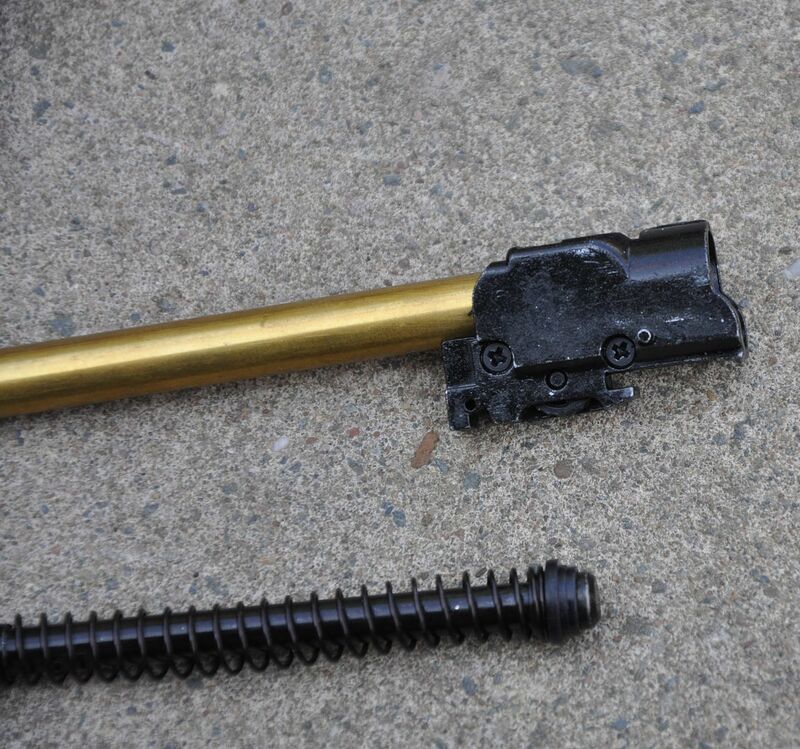 The outer barrel has threads for a silencer adapter. The safety catch is unusually black and seems to be well made. It actually reminds me of a different company made safety catch but I can't remember the name. 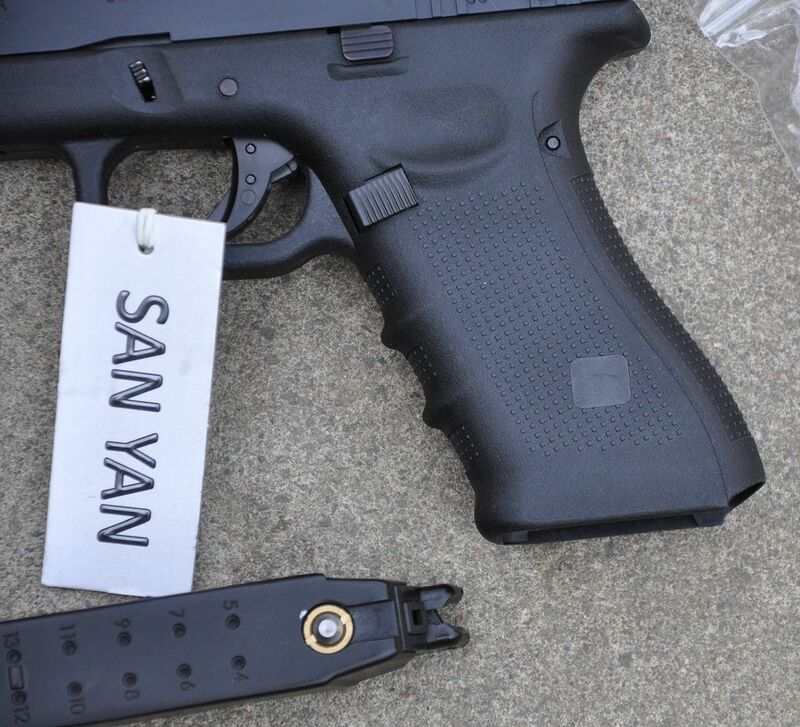 I'm wondering if SAN YAN used an OEM safety catch for this pistol. 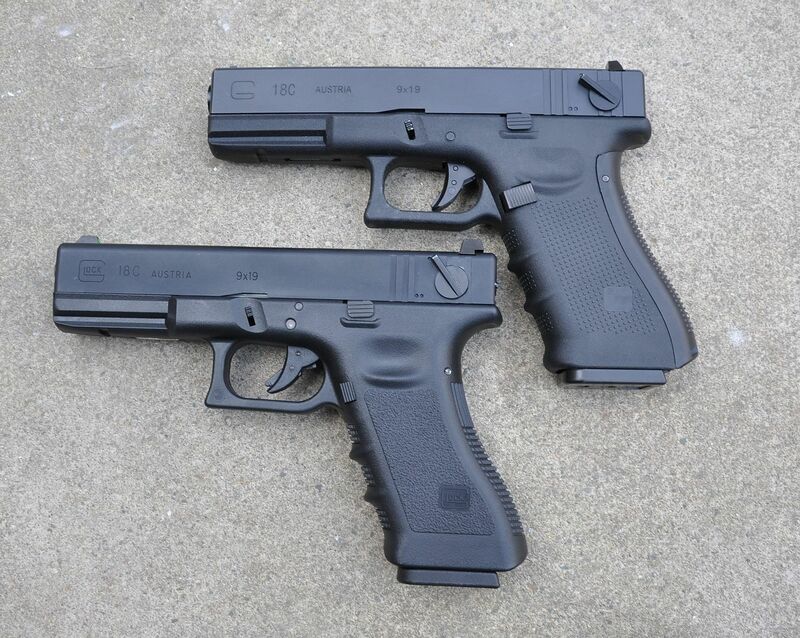 The Picture below is the SAN YAN compared to a TM Glock 18C with Guarder frame and lower frame (the SAN YAN is the top pistol). So that's the bulk of the pictures out of the way and you might be wondering if it's any good. I was as well when I bought it so I loaded the magazine up with 23 BB's, filled it with gas and fired off a few magazines. It will empty all 23 BB's in less than 2 seconds and lock back. On single shot it will fire all 23 and lock back when the magazine is empty. The slide moves smoothly and it feels nice and crisp to fire. The lubrication straight from the factory is good and a little silicone spray now and then will keep it working well. The hop unit works and will throw BB's out to 45 meters and is adjusted, just like the TM, by removing the top slide, adjusting the small wheel, fitting it back together again, firing and adjusting some more until you get it just right. There doesn't seem to be any hop creep, which is good and I'm more than happy with this. After a few magazines I noticed that the top of the outer barrel was showing wear and after looking more closely I realised that I hadn't removed a plastic film that sits on top of the outer barrel. I removed this and there was still some wear but I think this is more a case of breaking in and should stop after a few mags through it. Did i find any issues? Actually I did. 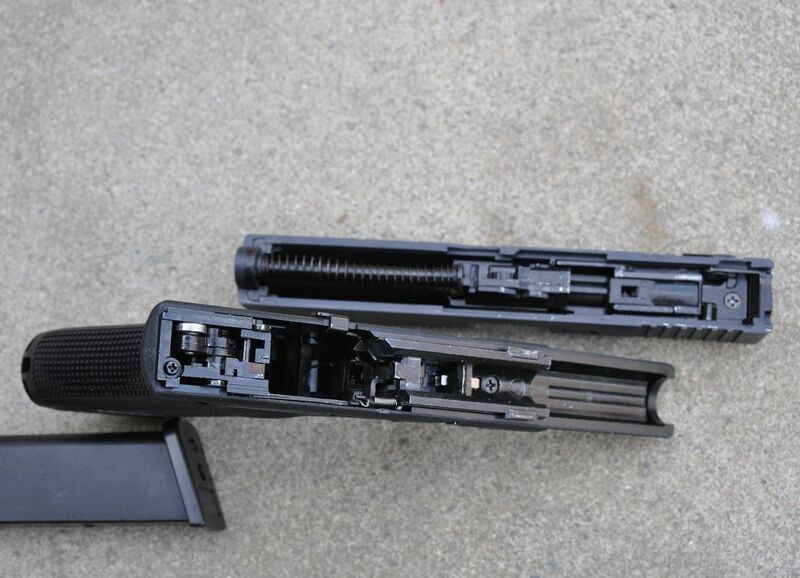 The biggest problem is that some TM compatible magazines fit and some don't. I found that WE magazines don't lock into place and fall out. I have a few different magazines and it was a bit hit and miss if they would work or not. This actually included the WE magazines as I had one that worked fine but another 2 that didn't. 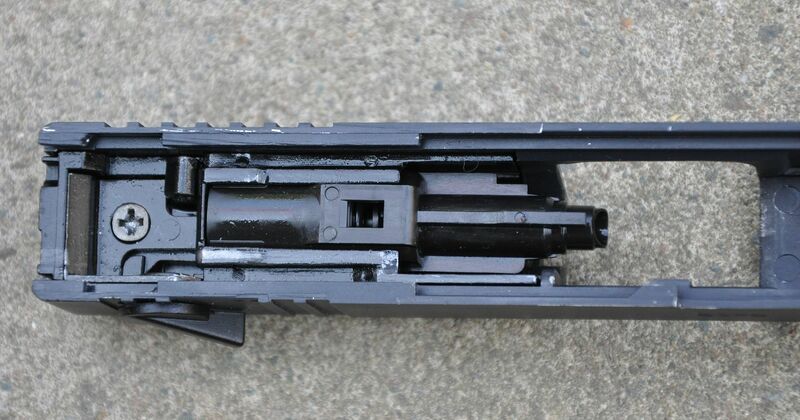 I think it's probably the magazine catch and either replacing it with a guarder one or filing it slightly would fit the issue. I'll look into this in more detail at some point. The good news was that the 50 round TM magzines work fine in it. 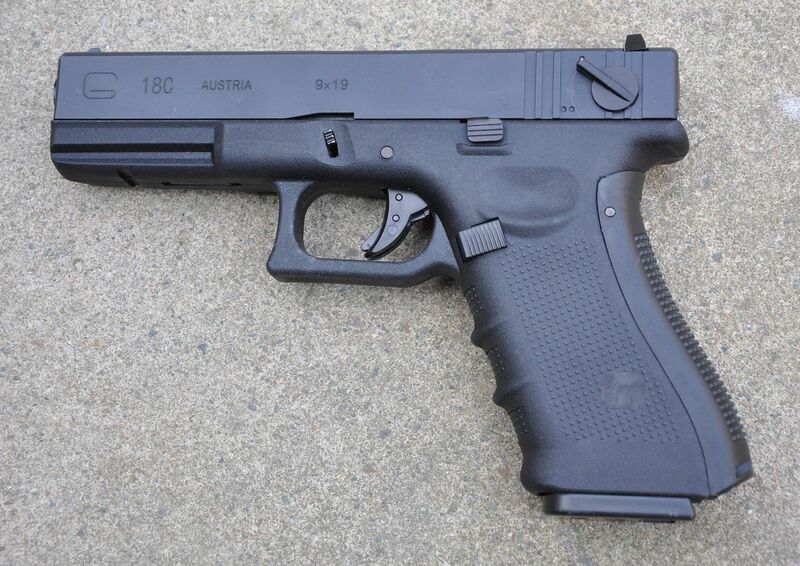 It's a good Glock 18C pistol with limited markings that works well but spare magazines might be a problem. 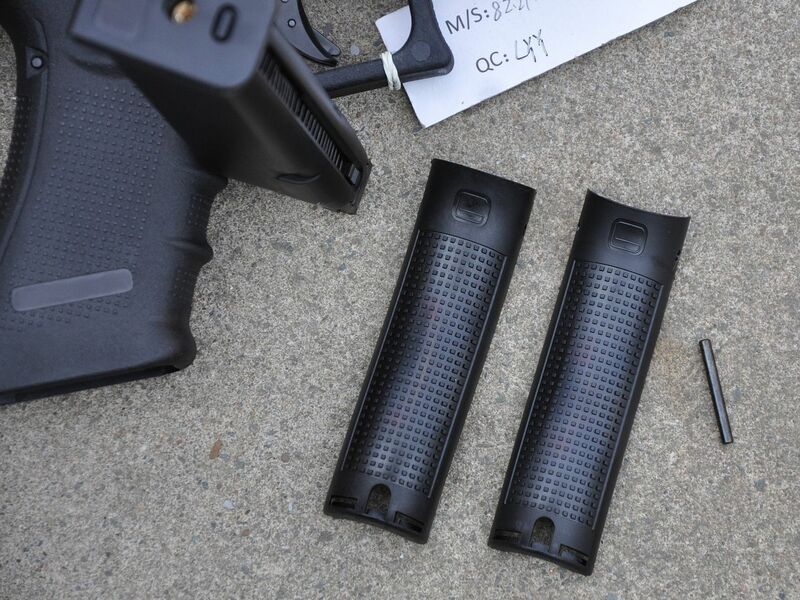 If you buy one make sure you try the spare magazines before spending your money on them. If something breaks on it then buying TM (or compatible) parts will fix it and it's quite a cheap pistol to use as a base for a anatomically correct Glock 18C. *Edit I forgot to mention that the FPS averages 250 FPS with the hop set.